have taken in fighting climate change, creating green jobs, and combating pollution. Still a great blend of engaging journalistic writing, high-quality academic analysis, and the latest scholarship, the third edition has been thoroughly updated to account for such major developments as the recentralization of federalism under the Obama administration and the further politicization and rising costs of judicial elections. The authors have expanded coverage of referendums and direct democracy, as well as the increased role states play in homeland security. 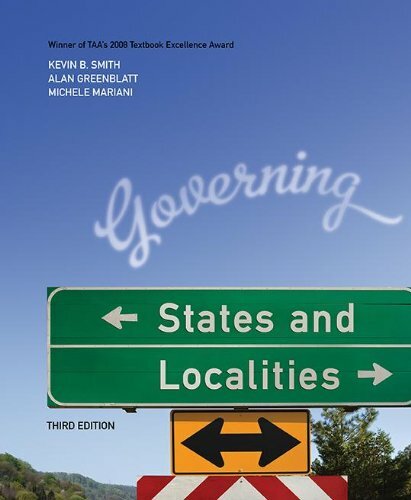 A series of well-designed features asks students to apply the comparative method ('A Difference that Makes a Difference'), to see how intergovernmental relations impact localities ('Local Focus'), and to see examples of how policies are actually implemented ('Policy in Practice'). An engaging full-color design, more than thirty maps, a vivid selection of photographs, updated tables and figures, and a marginal glossary all combine to keep your students focused and learning.